Starring Lauren German, Michael Biehn, Milo Ventimiglia, Courtney B. Vance, Iván González, Michael Eklund, Ashton Holmes, Abbey Thickson, Jennifer Blanc, Peter Stormare and Rosanna Arquette. Screenplay by Karl Mueller and Eron Sheean. Distributed by Anchor Bay Films. 121 minutes. Not Rated. It almost feels like a contradiction in terms, but is it possible for a movie about the end of the world to be simply too bleak? This is a question that keeps recurring while you are watching The Divide. The film is a variation of The Lord of the Flies in a nuclear fallout shelter in which nine civilians are able to make it down to a fortified basement of an apartment building when their city (and apparently the world?) is suddenly decimated. The apartment super was a survivalist and he stocked the place with food, a generator, mattresses and weapons. The survivors are stuck together in the small gloomy area, depending on each other to stay alive. They may have been better off just dying with the rest of the world. That may sound like an overly snide remark, but it’s not so far off base. If this is survival, who really needs it? 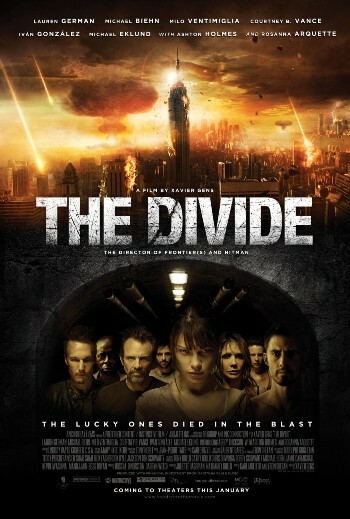 Because in The Divide, survival appears to just bring out the worst in people. And the longer the group spends together, the more inhumane they become. I know that is the point of the movie, but that doesn’t mean that I have to like it. There are not many movies that would make me want to die in a fiery nuclear blast, but this one kind of did. The Divide throws you right into the action, for lack of a better term. We are introduced to our story watching an extreme close-up of Eva (Laura German of Hostel II) – the closest thing to a human being here, but with her own faults – crying as she watches her city being bombed before her eyes. The filmmakers never explain how or why the destruction happens – the survivors theorize that an Arab country dropped a nuclear bomb, but honestly the brief destruction shots looked more like an alien attack. It has been turned into a survivalist bunker by the super Mickey (Michael Biehn) after the World Trade Center attacks, and he seems rather put off that eight of his tenants actually made it into his own little personal sanctuary. These tenants include Eva and her fiancé, two meathead brothers and their unstable best friend (Milo Ventimiglia, Michael Eklund and Ashton Holmes), a bright businessman (Courtney B. Vance) and an aging mother and her little girl (Rosanna Arquette and Abbey Thickson). Mickey, with his survival skills and being the host, takes charge. However, when their bunker is attacked by space-suited humans who kidnap the little girl and kill one of the tenants and the survivors are soldered into their bunker, anarchy spills over. The rest of the film is just watching the spread of degradation and insanity amongst the close-quartered bunker-mates, as food becomes currency and cruelty becomes par for the course. In the meantime, they are all growing sicker and sicker due to radiation seeping down into their space. This is supposed to be entertainment? Star Michael Biehn had told me a bit about this film last year. Well, I agree with the psychologically brutal part, anyway. Also, actually, for what they had to do, several of the acting jobs were very good. Eklund goes so far over the top eccentric that his character is fascinating. Arquette is very brave to play a woman who is so damaged and destroyed that she implodes before our eyes. German does a mostly successful job of retaining some sense of humanity in a film that has very little of it. Director Gens obviously has some skill as a director and he can certainly set a mood of foreboding, but much like fellow French genre specialist Alexandre Aja, the technical skill can’t overshadow an emotional disconnect. They are wonderful stylists, but not so good as storytellers. The story told in The Divide does not seem to be one that most people would ever want to experience. Honestly, that is probably a good thing. Copyright ©2012 PopEntertainment.com. All rights reserved. Posted: January 6, 2012. Tags: Abbey Thickson, Apocalypse, Ashton Holmes, Courtney B. Vance, end of the world, Eron Sheean, Iván González, Jay S. Jacobs, jennifer blanc, Karl Mueller, Lauren German, michael biehn, Michael Eklund, Milo Ventimiglia, movie review, Peter Stormare, PopEntertainment.com, Rosanna Arquette, the divide, The Lord of the Flies, xavier gens. Bookmark the permalink.